For a third straight session Wednesday, palladium advanced while gold, silver and platinum declined. Gold and silver drove their losses to four sessions in a row after they posted multi-month highs last Thursday. Gold for April delivery declined $4.80, or 0.4%, to settle at $1,314.40 an ounce on the Comex division of the New York Mercantile Exchange. "Both markets [gold and silver] are this week seeing normal and healthy corrective pullbacks from recent gains that pushed prices to multi-month highs," Jim Wyckoff, a senior analyst at Kitco Metals Inc., said in a report. "A rebound in the U.S. dollar index this week is also a negative for the precious metals markets." 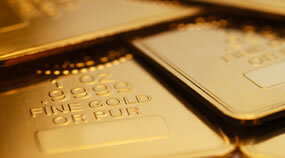 Gold futures ranged from a low of $1,309.90 to a high of $1,319.90. They inched down less than 0.1% on Tuesday and shed 0.2% on Monday. Last Thursday, they settled at their best price since April 24. Silver for March delivery declined 13.5 cents, or 0.9%, to settle at $15.701 an ounce. Silver futures traded between $15.67 and $15.87. They fell 0.3% on Tuesday and Monday. Last Thursday, they marked their best close since July 10. April platinum lost $6.10, or 0.7%, to $813.80 an ounce, ranging from $807.20 to $824.80. Palladium for March added $10.40, or 0.8%, to $1,351.60 an ounce, trading between $1,332 and $1,356. Gold declined $1.80, or 0.1%, to $1,312.40 an ounce. Silver fell 13.5 cents, or 0.9%, to $15.73 an ounce. Where do they sell platinum for $803 bills for 1 .oz. Remember when it sold above the rest. I’m sure it will back up on top someday.